Born and raised on the Iron Range, Hailey Lislegard has always had a love for operating heavy equipment. “I am from a long line of miners from the Iron Range that goes back generations,” Lislegard said. Lislegard, a two-year Local 49 member, said her passion for operating equipment began when she was growing up riding tractors with her grandfather on the farm. After Lislegard graduated high school she enrolled in the heavy equipment program at Central Lakes College. While in school, she gained sponsorship from the Operating Engineers Local 49 Training Center. Even before she officially became a Local 49 Apprentice, Lislegard said that she was already familiar with Local 49 and their training opportunities. “Local 49 is a big deal up here. The apprenticeship program is a great opportunity to practice and improve your skills, and it also provides a safe way to learn new equipment,” Lislegard stated. Lislegard is currently in the Local 49 Training Center’s Crane Apprenticeship program, and says she absolutely loves operating cranes. During her time as a crane apprentice, Lislegard has also had some great on-the-job experiences working on various projects. She started by working for Lakehead Constructors, where she worked on the Highway 53 Bridge Project in Virginia, MN. “After completing a project with Lakehead Contractors, I was then hired by Kiewit, the general contractor of the Highway 53 Bridge Project,” Lislegard said. It was during her time with Kiewit she had the opportunity to be around one of the largest cranes in the world. “I got to see a lot of things I never expected to see, I got a lot of seat time and I was blessed with some amazing operators to learn from,” Lislegard said. After her time working on the Highway 53 Bridge Project, Lislegard worked at the famous Soudan Underground Mine Project, which is a half-mile underground project. “Our job there is to actually take apart the lab since they’re moving to a different location,” Lislegard said. The Soudan Underground Laboratory is a general-purpose science facility, which provides the deep underground environment required by a variety of sensitive experiments. The Lab currently hosts two large projects for the University of Minnesota. 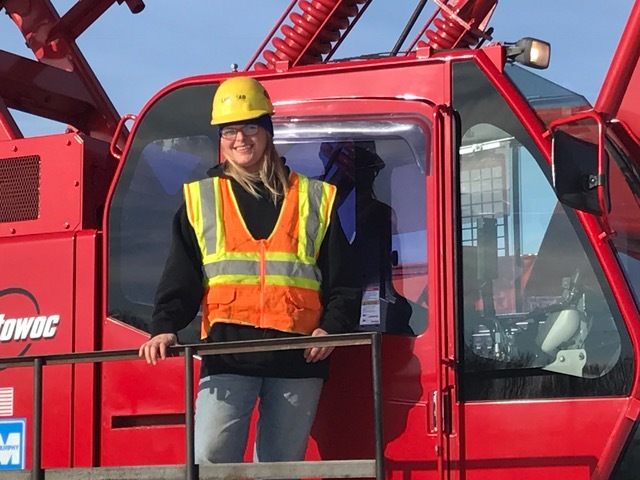 Lislegard is currently finishing up her second year in the crane apprenticeship program, and says that the opportunities she has received from the Local 49 Training Center has had a positive impact on her life. “This has been the best decision for me; I make a pretty good wage for a 23-year-old, I have health insurance and I know a lot of people my age that are going to college that don’t have any of that stuff yet,” she said. “If college isn’t for you, I would definitely look into Local 49 and the Local 49 Apprenticeship Program,” Lislegard added. For more information and for more stories like Hailey’s visit www.local49training.org.